As the Chicago Teachers Union has decided not to end its strike, Chicago's mayor says the city will file a lawsuit forcing it to do so. 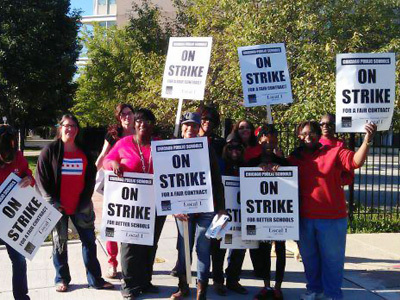 The teachers have been without contracts since June, and no settlement has been reached on their demands. The teachers say they feel “rushed,” and want to have an opportunity to continue to discuss the offer on the table, union president Karen Lewis said. "Our members are not happy," Lewis said. "They want to know if there is anything more they can get." The union’s delegates are expected to meet again on Tuesday. Students will not return to the classroom Monday after a week of negotiations between union leaders and representatives of the country’s third-largest school district. 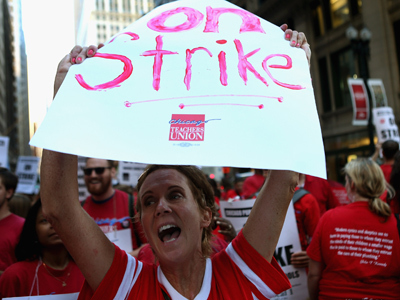 Parents, striking teachers and district officials have been hopeful that classes could resume Monday after a week of picketing, marches and protests as the district pushed an austerity program on teachers, who have been working without a contract since June, the Associated Press reported. After five days of protests, teachers and their supporters held a rally Saturday to celebrate union power in the US. The demonstration featured thousands of teachers and their advocates holding homemade signs and wearing red T-shirts, representing the union. 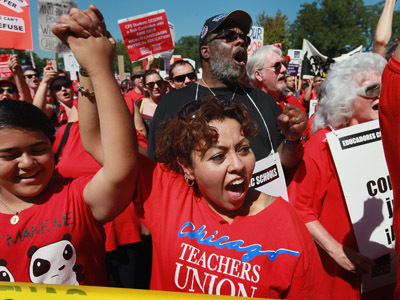 Chicago Teachers Union President Karen Lewis said in a speech at the rally that a framework for an agreement had already been made, but a contract was still pending. 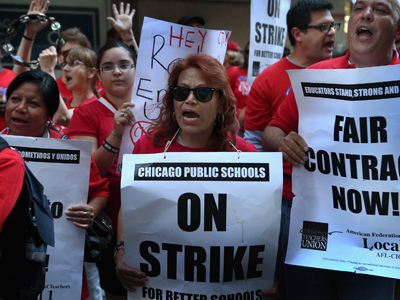 After almost a week of picketing schools and marches through downtown Chicago, rallying teachers still had mixed feelings over whether or not a deal could be reached before the school week began on Monday. At the end of the day, the union said it planned to present a three-year proposed contract to its 800 delegates to vote on. The delegates would then decide whether or not to continue the strike. The contract would include a 3 percent cost of living increase during the first year in effect, and a 2 percent raise in the second and third years. The district and union would also be able to extend the contract into a fourth year. The contract also addresses the main points that led to the strike in the first place, including the hotly disputed teacher evaluation system. The contract proposes that half of all open jobs in the education system would be given to laid-off teachers and a new evaluation procedure would allow teachers to appeal their ratings, which are based in part on standardized test scores. Critics of the system say such an evaluation process forces teachers to decide between either teaching a solid curriculum and teaching solely to a standardized test. Previously, 40 percent of teacher evaluation scores were based on such scores. Under the proposed contract, the scores would still account for 30 percent of the teachers' evaluations. “We believe this is a good contract, however, no contract will solve all of the inequalities in our District,” Lewis wrote on the union website late Saturday.